Over the past few years, Joynt bartender Manas Sanyal worked with owner Bill Nolte (neither pictured) to identify the musicians adorning the tavern’s walls. On my first day living in Eau Claire, I unpacked my possessions into my tiny rented room and headed to The Joynt. I didn’t know my love affair with this Water Street tavern would start then; but I suppose you never know when those things are going to happen. It wasn’t just the amazing mood lighting or the righteous collection of vintage beer cans that drew me in at first. What really blew me away were all the pictures of jazz icons throughout the bar. I realized this was hallowed ground that had seen the likes of Charles Mingus, Brother Jack McDuff, and Bill Evans. My informal method of barstool research has revealed much more about The Joynt as a venue over the last few years. From 1974 to 1990, The Joynt hosted monthly shows from nationally known artists. 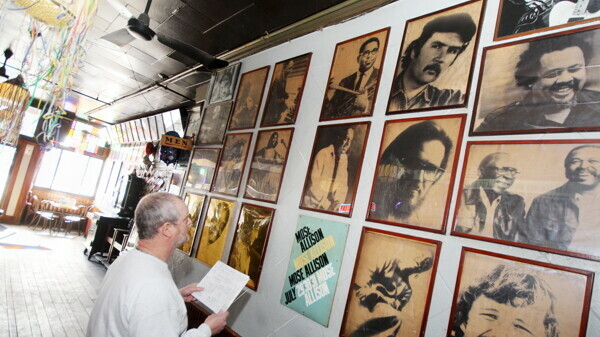 Owner Bill Nolte was an amazing booker of these shows, which featured 32 Grammy-winning artists. In a cover story on national jazz clubs, USA Today listed The Joynt between New York’s The Village Vanguard and Washington, D.C.’s Blues Alley as a national jazz mecca. Nolte’s idea for making sure the mecca was crowded with jazz pilgrims was simple: He sold only 150 seats to many of these shows to break even on paying the musicians. This made for some of the most intimate performances these musicians would play in their international careers. Unfortunately, this good thing had to come to an end. In the many news stories about the end of The Joynt as a venue, Nolte cited low attendance from UW-Eau Claire students as one of his main challenges. This is one of the most amazing parts of this story looking at it from the present day. Now UWEC music students revere these jazz icons and play many of their pieces at the university’s prominent jazz festival each year. Though I suppose the times are always a-changin’. You can still see and hear some of the remnants of The Joynt’s days as a venue. The jukebox plays through the Altec speakers that comprised the PA system, and if you look closely above the pool table you can see two of the stage lights, which are pretty fixtures and provide warm light. Over the past few years, bartender Manas Sanyal has worked with Nolte to identify all the musicians who played there and have their pictures adorning the walls. Sanyal keeps a pamphlet of all the musicians and their performances behind the bar. It’s a mind-blowing document for any American music fan to take in. The pamphlet is not just a list of names; it is a map of the pictures on the walls. When I looked at it, I was able to put the names to many of the faces who played there. It makes the walls come alive in a new way. It starts to sink in that you are looking at pictures of Willie Dixon and Ramblin’ Jack Elliot and not just photos of random people put up for the sake of ambiance. In addition to identifying these musicians, Sanyal attended 15 shows played by artists who once played at The Joynt, every time bringing along a shirt chronicling the venue and artists. He says that many of them love recalling their performances there. It’s that connection with the past and maintaining this record that makes The Joynt such a special place for many of us. The absence of light beer doesn’t hurt either.